Convenient eco-friendly tea filters for loose-leaf teas. These convenient tea filters are great for having loose-leaf tea on the go - made of paper fibre, they are completely biodegradable and eco-friendly. 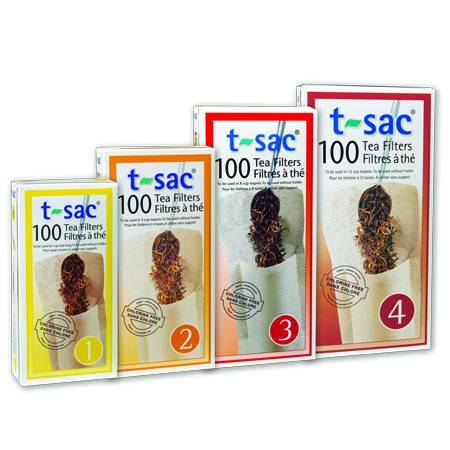 Each retail pack comes with 100 tea filters. If you are having tea at home, however, we would recommend one stainless steel infuser, or one of our beautiful teacups or pots with included infusers. Have you tried T-Sac Disposable Tea Infuser? Tell us what you think! Great product, a great seller for our customers. Handy when you don’t have an infuser but a little big for a single cup. Love the T-Sacs. No fuss, no muss. Great for when you’re in need of a tea filter and don’t have an infuser!